The Marion basketball teams lost two games to Sedgwick Tuesday on senior night. The girls lost a heartbreaker in overtime, 37-36, while the boys lost, 56-41. Julia Hall scores to bring Marion within 21-20 during the third quarter against Sedgwick Tuesday. Hall led all scorers with 10 points in Marion?s 37-36 overtime loss. Girls?A last-second basket by the Cardinals turned a one-point Marion lead into a one-point deficit when the final buzzer sounded in overtime Tuesday, 37-36. The game could hardly have been more close, as both teams led by no more than four points. Neither team scored the first 2:42 of the game, and Sedgwick put the first points on the board. From there, Bailey Robson, Kirsten Hansen and Julia Hall contributed to a 6-0 run that gave Marion its largest lead of the night, 6-2, at the 2:51 mark. But the Cardinals ended the first quarter with a 6-0 run of their own to lead, 8-6, at the first break. 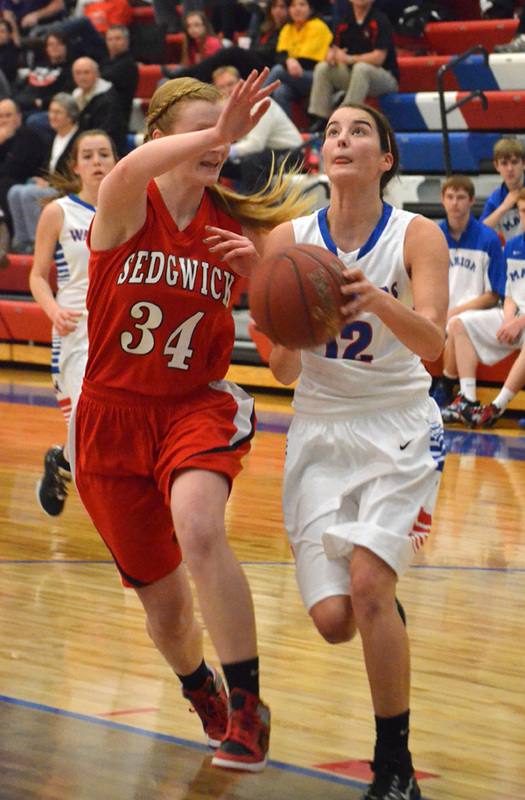 Sedgwick took its largest lead of the night, 10-6, with a basket 30 seconds into the second period. Baskets by Marshelle Mermis and Hall tied the game at 10. Robson and Kirsten Hansen each made three-pointers to help push Marion in front, 18-15, by halftime. The Cardinals tied the game then took the lead, 21-18, with a three and a three-point play before Hall scored Marion?s first points of the third period at the 4:03 mark. McKenzee Remmers scored the Warriors? only other basket?a three-pointer with 40 seconds to go?and Marion trailed, 24-23, heading into the final period. After a Sedgwick score, Marion used a 6-2 run to take a 29-28 lead when Hall scored at the 2:17 mark. A Cardinal three left Marion trailing by two, but Kourtney Hansen knocked down two clutch free throws with 47 seconds left to tie the game at 31. Sedgwick?s Sydney Hilliard?s three-point attempt bounced off the rim, sending the game into overtime. Kourtney Hansen gave Marion a two-point lead with two more free throws, but after a Sedgwick miss, Marion turned the ball over, leading to a tying basket by the Cardinals. Kirsten Hansen made the second of two free throws, giving Marion a 34-33 edge. Then Sedgwick reclaimed the lead, 35-34, with 1:17 to play. Following a Warrior turnover and a Sedgwick miss, Kirsten Hansen made a basket with 15 seconds to play that put Marion in front, 36-35. But Hilliard made the game-winning basket with just one second to play. Hall led all scorers with 10 points. Mason Pedersen shoots for two during the second half against Sedgwick Tuesday. Pedersen scored six points in Marion?s 56-41 loss. Boys?Marion struggled to find its rhythm in Tuesday?s 15-point loss to Sedgwick. The Warriors took a 2-0 lead out of the gate when Bret Voth scored, but things went quickly southward, as Sedgwick scored 10 unanswered points to lead 10-2 at the 4:41 mark. Voth drained a three-pointer, and the teams traded scores. Sedgwick gained distance to lead, 17-7, at the end of the first quarter. The Cardinals outscored Marion, 11-4, in the first six minutes of the second period, building their lead to 28-11. Nicholas Stuchlik accounted for both of Marion?s baskets during that stretch. 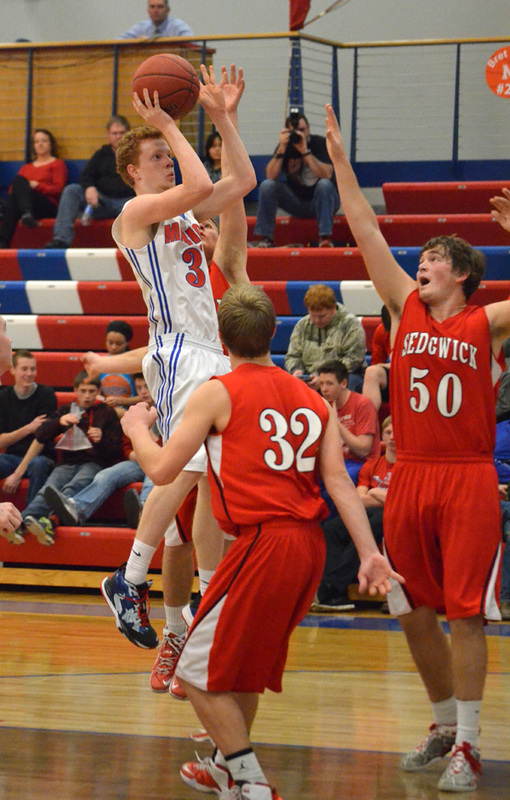 Jacob Baldwin added a pair of free throws, and Sedgwick led, 31-13, at halftime. Marion nearly doubled its halftime score in the third quarter, outscoring the Cardinals, 12-9. Voth and Dylan Pippin led the charge with four points each in the period. By the end of the quarter, Marion trailed, 40-25. The Warriors battled the Cardinals evenly through the final quarter, as each team scored 16 points. Stuchlik and Mason Pedersen each scored six points in the quarter. The pair combined for a 6-0 run midway through the period to bring Marion within 52-38 with 3:03 to play. The Warriors drew within 13 with 1:26 to go, but fell by 15 in the end. Voth led the Warriors with 11 points. Stuchlik added 10. Coming?Marion will resume play in its final regular season game next Tuesday with a rematch at Sedgwick.